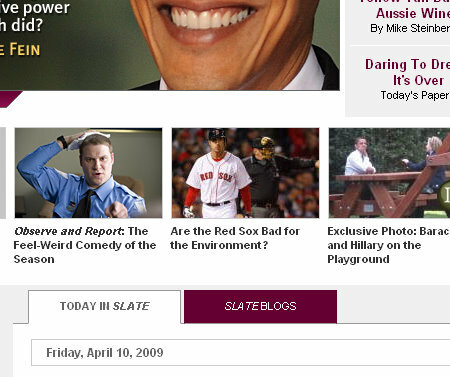 Slate Pulls a Sox-Yanks Switcherchoo! Cheated! Duped! Defrauded! I’d been tricked — lured — entrapped into clicking on what I thought was a story about my beloved BoSox only to be taken to a story about the Yankees! But as I skimmed down the page, I realized this wasn’t even a story about the Yankees. It wasn’t even a story about baseball at all, but about pro sports in only the most generalized and generic terms. And it was from last year! It was like clicking on a link about Jennifer Aniston, being taken to a headline about Angelina Jolie, and then finding out that the story was actually about Hollywood’s classiest plastic surgeries…from last year. Sure, I might have been interested in reading that story — but not after feeling like I’d been tricked into boosting their pageviews by less-than-honorable means. 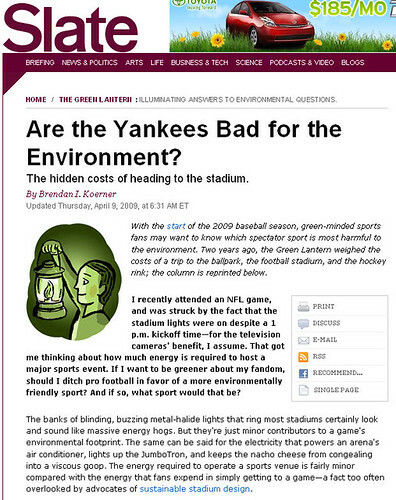 Antiquated Fenway Park in Boston is arguably one of the most eco-friendly stadiums in the nation, because of the fact that parking is so scarce and most fans must take public transportation. That gives it a big leg-up on modern counterparts that claim to be green, whether by virtue of their solar-powered LED boards or their cup-and-bottle recycling programs. Suddenly, it was Casino Royale all over again: wait, Vesper betrayed Bond?! But did she really betray him, or was she actually trying to save him? And is that French guy really a double-agent, or only a spy pretending to be a bad spy who’s really a good spy? And what the heck happened to the money??? the credibility of this story is completely intact when buttressed by a picture of Obama at a picnic table, and Seth Rogen. also – I don’t know why no one has looked into converting Youkilis’ head sweat into some form of renewable energy. DISCUSS.